Carrot juice has a number of health benefits. The carrot provides what is certainly the most important basic juice. The yellow color is due to carotene. Another name for this form of carotene, the transform, is pro vitamin A. Many authors write that carrots contain a lot of vitamin A. This is not actually true; what the carrot does contain is the pro vitamin. That means a substance that is converted by the body into the vitamin itself. Carrot juice plays the most important part in an infant's supply of vitamin A. 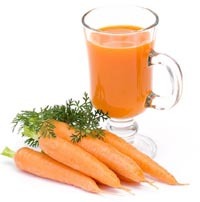 When carrot juice is consumed jointly with milk, the utilization of carotene as vitamin A is considerably increased. A carrot and milk juice is the ideal vitamin A source for infants and can in no case lead 10 the risk of the child having too much A. Carrots are widely used. Indeed it is estimated that in Germany carrots account for 10% of the total vegetable consumption. From the carrot juice point of view, the varieties to be employed are ideally those with the most carotene. It is fortunate that the pro vitamin is strongly colored for this means that so long as you use good colored carrots they are likely to be the best nutritionally speaking too. As a general rule, early carrots are pale and low in carotene. Because carotene is not water soluble, but is fat soluble, there is not a very great deterioration in the vitamin content on storage. Nursing mothers are well advised, for the sake of the quality of their milk, to take carrot juice throughout lactation. When the baby is on its way it is good sense not only to drink the juice but also to nibble a carrot when you feel hungry. For although a good sized one will provide your minimum requirement of vitamin A, 7oz (200g) of carrot contain only 50 calories, which cannot be considered to be a fattening snack. The carrot is recorded as being used in medicine by the early Greeks and has been cherished ever since. Its juice is one of the most delicious and healthful, and alone or in combinations should be in every daily diet providing, as it does, the essential vitamin A, without the saturated fats with which this vitamin is associated in eggs and butter. Kevin Pederson has been managing a number of natural home remedies websites. Visit www.home-remedies-for-you.com.